I had high hopes as I setup the blacklights in the pine/oak-hickory forest at Jordan Recreation Area on Lake Norfork in north-central Arkansas. The late June timing and warm, humid conditions with no moon were perfect for wood boring beetles, and as dusk settled in I awaited their expected arrival. But the beetles never came, and as dusk waned to full darkness I knew it was going to be one of those inexplicably mediocre nights. If I’d had a hotel room waiting for me, I would’ve closed up shop as soon as this became apparent and headed on back. This night, however, I was camping so there was really nothing else to do but see what else came to the lights anyway. 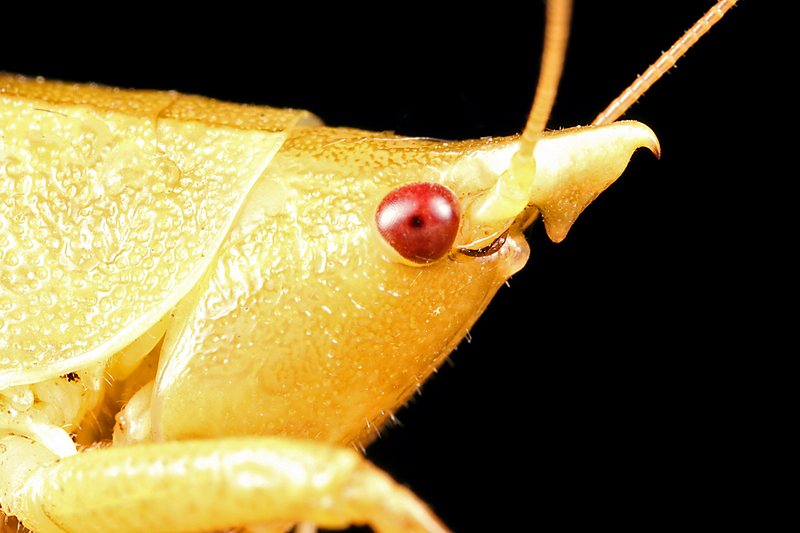 One of the more interesting was this conehead katydid, whose bizarre hook-shaped cone immediately identify it as the hook-faced conehead, Pyrgocorypha uncinata. There are a number of coneheads in the eastern U.S., but I couldn’t recall ever seeing one with such a bizarre-shaped cone before. There is good reason for this, as Singing Insects of North America shows this southeastern U.S. species to be at the limit of its distribution in northern Arkansas. Looking at the above photo at home, I couldn’t help but notice the “face” formed by the eyes and cone, with the gap between the cone and the rest of the frons forming the “mouth” and the cone itself the “nose”—it looked to me like some weird, garrishly grinning fish! Thus was born Super Crop Challenge #7, and since four participants correctly identified the individual in the photo down to species this challenge was decided on bonus points. Max Barclay (Natural History Museum) earned the most (11) to win the challenge, while Patrick Coin and Sam Heads each earned 10 to round out the podium with a 2nd-place tie. This was the last challenge of the BitB Challenge Session #3, so we can now crown a winner. Today’s win vaults Max Barclay from 4th place in the overalls to the top spot with 29 pts—congratulations (and contact me for your loot). Tim Eisele‘s 5 points in this challenge gave him a total of 24 pts, which was just enough to edge out former front-runner Troy Bartlett for 2nd place by a single point. Troy keeps a foot on the final podium ahead of Dave with 23 points, also by a single point. My thanks to the record 27 participants who took part in BitB Challenge Session #3. The final overall standings are shown below, and look for the first challenge of BitB Challenge Session #4 coming up. IDC = ID Challenge; SCC = Super Crop Challenge. This entry was posted in Orthoptera, Tettigoniidae and tagged Arkansas, entomology, insects, katydids, nature, science. Bookmark the permalink. I can’t help but think of Beldar and Prymaat and the rest of the Conehead family.